Bake a sheet cake the size that you need. With an icing filled bag and round tip, size #4 or #5, draw Tinkerbell on the sheet cake. Refer to the second Tinkerbell Cake picture below for the outline. Cut cake away from the drawn shape of Tinkerbell. Use the cut pieces of cake to form the flower. Make a dark pink icing and a light pink icing. Using a star tip, size #18 and dark pink icing, cover alternating petals of the flower. Cover the remaining petals with light pink icing and the same size tip. Using round tip, size #5, make piping line in center of each petal using opposite colored icing (light pink on dark pink petal, dark pink on light pink petal). Next, cover the wings of the Tinkerbell cake in a light blue icing and star tip, size #18. Outline the wings in a darker blue icing and round tip, size #5. Make a flesh colored icing by using very small amounts of red and yellow coloring to achieve the flesh color. Using star tip, size #18, cover the skin area leaving room for the eyes. See the picture below for reference. Use white, blue and dark chocolate icing and round tip, size #5 making sure you slant the eyes enough. Put eyelashes in and eyebrows, marking for nose and outline of mouth. 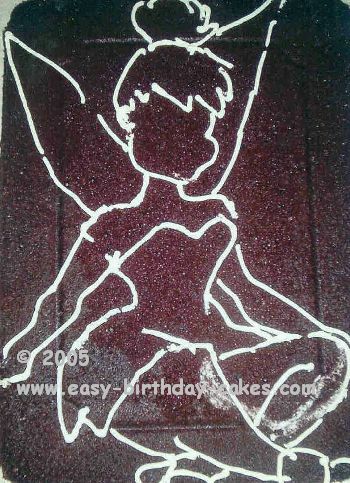 Outline all skin areas of the Tinkerbell cake in flesh colored icing and round tip, size #5. Next do the shoes and dress using star tip, size #18. The balls on the shoes are the same color blue as the wings and outlined in a darker blue the same as the wings are. The dress is a very bright green. To make this bright green color, make green icing and add yellow until you have the bright green color that Tinkerbell is noted for. Outline the dress and shoes in the same green and round tip, size #5. The hair is done in yellow icing and star tip, size #18. outline the hair in light brown icing and round tip, size #5. Finally, pipe the ribbon in the hair using the darker blue icing that you used for the wings and round tip, size #5. Make sure you check out these other popular pages too! If you have made an tinkerbell birthday cake that you would like to share, please submit your cake here and let us know how you made it! We would love to feature your cake on our site. Please make sure to include a photo of your cake and a description of how you made it, so that we can all share ideas and learn from each other! Tell us in your own words how you made and decorated your cake. You can wrap a word in square brackets to make it appear bold. For example [my story] would show as my story on the Web page containing your story. Please add a picture of your cake here. Click the button and find it on your computer. Then select it. 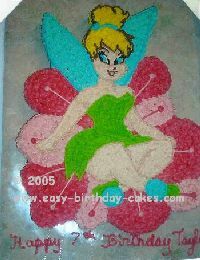 See Tinkerbell Cakes That Were Submitted By Others To This Site! The Tinkerbell cake and cupcakes are frosted with whipping cream and for all the decorations I used gum paste fondant.